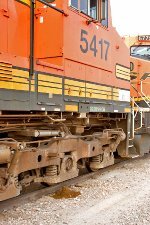 Description: BNSF Eastbound Freight Train passing through Holbrook, Az. Description: Hot westbound stack train rolls through Kentucky Street on the Thayer South Sub. Description: Ore empties ready to depart on a snowless, dreary day. Description: Is it me or is 4490 really faded? Description: Approaching Pulaski County N Highway headed over Dixon Hill is BNSF Train M STLKCK4 15 with a new GEVO on the point just before sunset. Description: BNSF 5417 and 5411 sit idle in the Centralia yard under dark skies. This was part of the power for a coal train. Description: As the rear of the H VAWBAR1 08 rolls of into town, the disturbances in the air the train made while rolling by are felt as a cornfield's crop sways to and fro for a few moments after the train has passed by. Description: A colony of bees decided to occupy an orange cone fixed to a tie at the west end of Departure 4, right next to BNSF 5417 - the second unit in the outbound consis of Sioux City, IA to Merna, NE train U-SIOMRM1-02. Six cans of wasp spray took care of this service interruption so that the locomotives could be safely inspected before departure.